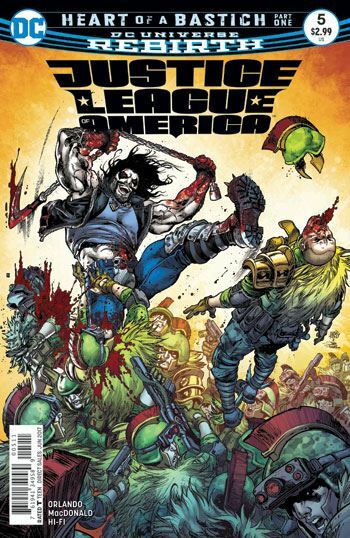 Lobo gets to be in the spotlight in the latest issue of Justice League of America. It’s not a solo story, though, the whole team gets into the action as a city gets into the business of constructing bizarre weaponry for an interesting new villain. Steve Orlando’s social consciousness gets to be expressed as he raises the economic situation that drives a workforce to produce the machines that will cause them nothing but trouble and death. Even when the Justice League show up to help them, now that Aegeus has taken pretty much complete control of Penn City, the people question what they will do when Aegeus is shut down, and they are looking at 90% unemployment again. I do enjoy the way these issues get raised in this book, without detracting from the interplay between the heroes, and the action against the villains. What I don’t enjoy quite so much in this issue is the art. For much of the issue, Andy MacDonald’s work looks, frankly, amateurish. This is most notable in pages when he is drawing the women. Killer Frost, Vixen and Black Canary all come off quite poorly. On the other side, when MacDonald is drawing Lobo, he gets it right. Perhaps he was selected because this is a Lobo-centred tale. 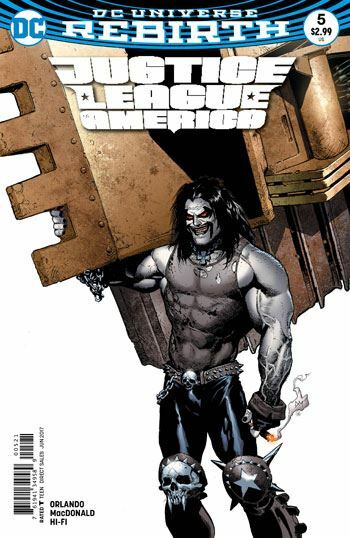 I do love the pages where Lobo faces the bizarrely garbed army of Aegeus’ armed men. I also like the scene towards the start of the book where the League make their cave accessible to the public, renaming it Mount Justice. And the villain himself is entertainingly introduced. We only get a bit of sense of the character, but the mythologically themed weaponry he is having produced certainly bodes well for the rest of the story arc. I can hardly wait to see it in action.